Controlling physical objects that require electricity and an Internet connection through a novel digital realm like virtual reality seems as though it may be more hassle than it’s worth. To begin with, all the available changes you could make with a virtual reality interface would have to be programmed into the interface, so what would be the point of having a virtual reality interface to control Internet of Things (IoT) devices? The point is to harness increasing computer power and programmable interconnectivity to make a virtual reality interface that will eliminate a user’s need to know how to program. Like the graphical user interface (GUI) created at Xerox PARC and implemented on the first Macintosh computer in 1984, this is an attempt to make a virtual world where your physical objects have a manipulatable twin. On your desktop computer or mobile computing device, you click on a digital item to command your computer or device to run programs to achieve a user-desired outcome. With this prototype, researchers at Autodesk Research and the University of Manitoba are adding the IoT connection between physical objects powered by different actuators. Using Unity and HTC Vive, the team of researchers created Ivy, an immersive programming tool, to help users visualize, understand and program virtual data in a digital representation of a physical space. A simple program intertwines conditional sensor data (i.e., when a sensor reaches a certain measurement) to physically activate a connected object, like a lamp or a fan. Eight professionals were asked by the research team to try Project Ivy. You can see the results and the demo in the video below. 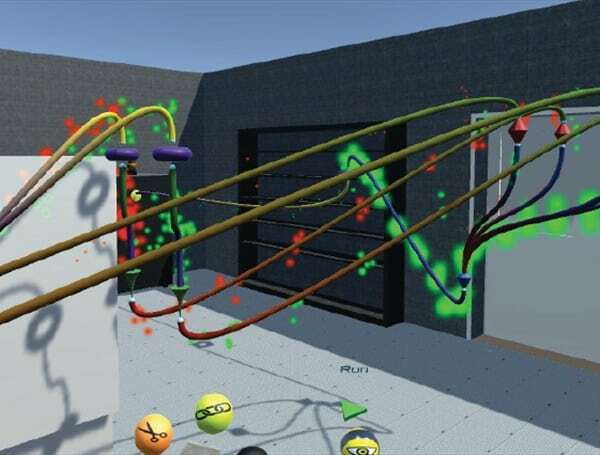 This immersive visual programming tool for writing IoT behaviors in connected objects requires a lot of background work setting up actuators, sensors and the HTC Vive kit. However, the software’s ability to make it easier for IoT enthusiasts to author changes to their IoT setup through virtual reality will probably find its most utilitarian application in training IoT professionals. For more information on Ivy, please read the paper authored by team members from Autodesk Research and the University of Manitoba.